It appears that people are slowly, although reluctantly, but are finally adopting Windows 8 as the preferred operating system. Windows 7 is still ruleing the roost with the market share of staggering 44.82 percent only to be followed by Windows XP, which simply refuses to leave, while still holding market share of 37.74 percent. It is quite surprising to see people using Windows XP despite knowing the fact that the support for it officially ends in less than a year, in April 2014. As for Windows 7, it is highly unlikely that people will stop using it so soon. Many people took a pretty long time to migrate from XP to 7, thanks to Windows Vista, and they probably don’t wish to migrate yet again only when everything seemed to be settling down for them. However, if the statistics shown by Net Applications are to be believed, the Market Share data for May 2013 are as follows: Windows 8 finally gains some 0.43 percent, growing from a measly 3.84 percent to 4.27 percent, Windows 7 also grows from 44.72 percent to 44.85 percent, which is 0.13 percent. Windows XP, on the other hand loses 0.57 percent, falling from 38.31 percent to 37.74 percent. As for Windows Vista, it also loses 0.24 percent, to fall from its already meager 4.75 percent to 4.51 percent. 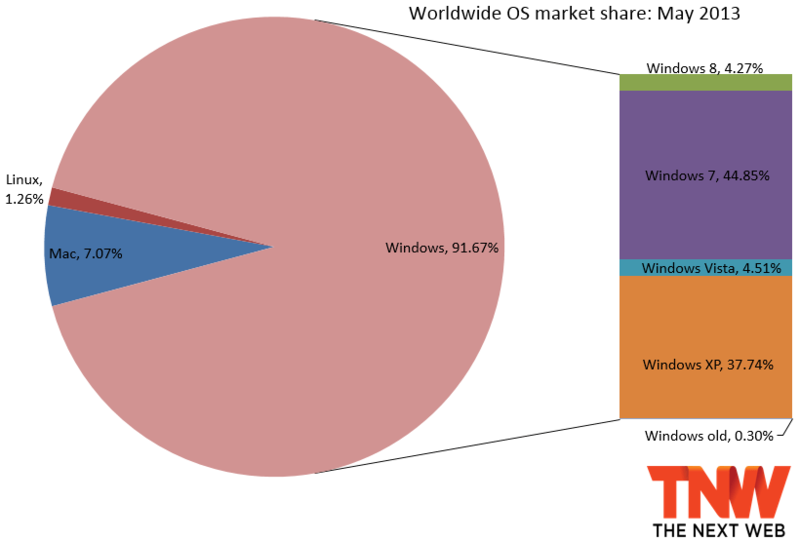 On the whole, Windows lost 0.11 percent market share between April and May. Needless to say, the lost market share was picked up by Apple Mac OS X, which gained 0.06 and Linux gaining 0.05 percent, and growing to 7.07 percent and 1.26 percent respectively. We can also expect Apple Mac OS X’s share to rise a little more, with the highly awaited WWDC event which is a week away, where Apple plans to showcase its latest Mobile and Mac Operating Systems. In case of Windows, as we are all aware, Windows 8.1 free update is on its way as well. Perhaps some Windows XP and 7 users are waiting for the update before migrating to Windows 8. Windows 8.1 will also mark a return of the Start button which is missing right now. The Start button will return alright but will not be the same as the one in earlier versions of Windows. The Windows 8.1 is a free upgrade to Windows 8 and it will be available to download from the Windows Store as and when it releases, for free.